Born in Jamaica in 1931, Dizzy Reece started playing the trumpet at the age of 14. His schoolmates included Joe Harriott and Wilton 'Bogey' Gaynair. He came to London on the M.V. Windrush in 1948 but his erratic playing did not endear him to the London bop musicians and he failed to establish himself into what he later referred to as a 'closed shop'. He left for Europe and worked in Paris (1949/50) with Don Byas and Kenny Clarke before playing in Germany and Holland also with Byas. He returned to the UK in 1954 and was heard with Kenny Graham's Afro Cubists and he joined the Tony Crombie band, a medium sized band based on the sound of James Moody's Blue Note recording band, noted for its unrelenting attack, and he stayed with them into 1955. He returned to Europe and travelled and worked through the mid fifties returning to London to play and record from 1955 to 1958. His style of playing at this time took leaps forward and back, a situation not helped by Reece's reluctance to play unless he wanted to, unless the conditions were just right, or unless he could do as he wished! 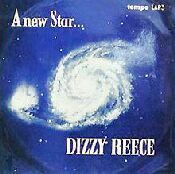 At a time when most other British jazz trumpeters were copying either Clifford Brown or Miles Davis, Reece sounded like neither. He did not get on with many of the London musicians, he always had a problem finding suitable drummers, but did form happy and useful alliances with drummer Phil Seamen, vibraphonist Victor Feldman, and with the tenor saxophonist Tubby Hayes who all appeared on the fine Tempo recordings he made in this period. His services had not been wildly sought after by the London jazz club proprietors, his playing could be erratic and it was difficult to get musicians to work with him. By now his style was extrovert post bop and he was a capable and original soloist. His early style was based very much on Dizzy Gillespie. The considerable emotional content in his work led to him being described as erratic. His solos often had an angry sound but he developed his own style that was always instantly recognisable. As he developed much of the early Gillespie influence receded. He had recorded with Kenny Graham and Victor Feldman and under his own name. In 1958 he recorded for Blue Note in London as The Dizzy Reece Quintet with Donald Byrd and Art Taylor alongside Tubby Hayes and Terry Shannon. In 1959 he made the decision to settle in New York. His services had not been wildly sought after by the London jazz club proprietors, his playing could be erratic and he always had a problem finding suitable drummers. His style now was extrovert post bop and he was a capable and original soloist. His early style was based very much on Dizzy Gillespie. The considerable emotional content in his work led to him being described as erratic. His solos often had an angry sound but he developed his own style that was always instantly recognisable. As he developed much of the early Gillespie influence receded. A number of American jazzmen who heard Reece play, such as Miles Davis and Sonny Rollins, were impressed and in 1958 Tony Hall, A UK record producer and big fan of Dizzy, engineered Reece's signing to the prestigious Blue Note label. Reece's first Blue Note date, Blues In Trinity, is a record of sky-rocketing hard bop energy, pitting Reece and Tubby Hayes against the trumpeter Donald Byrd and drummer Art Taylor. Reece outshines everyone (save perhaps Hayes, who is in mercurial form) and the whole set vindicates Tony Hall's decision to support the trumpeter. In 1959, Reece moved to New York but his move did not herald the success and recognition that everyone hoped for and actually began the abstraction of his career. Two more Blue Note dates followed in 1960, (they were not released until many years later), neither was as impressive as Blues In Trinity and Reece's profile on the jazz scene was not prominent. 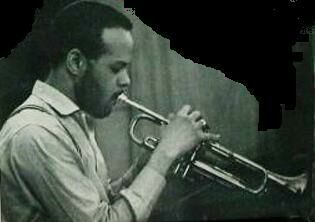 In the 1960s, Reece returned to Europe and worked with Dizzy Gillespie, Hank Mobley and others and recorded only sporadically in the 1970s. By the 1990s little was heard from him and Reece remains an example of a great early promise that ended ultimately in anti climax. It is a great pity that Joe Harriott and Dizzy Reece never recorded as a quintet. An attempt to get them together on record was, in Tony Hall's recollection, "a total disaster - the session ended in a raging argument between the two front line men because of both men's intractable belief that their own direction was the only one." Brawl For All*^+/The Big Fist*/Sunshine On a Dull Day*^/Sonor*^/Hand In Hand*/When? *# (omit Deuchar and Humble). Dizzy Reece (tp), Victor Feldman (p), Lennie Bush (b), Phil Seamen (d). Dizzy Reece (tp), Victor Feldman (p), Lloyd Thompson (b), Phil Seamen (d). Stomp(1)*#/Riviera(2)*/Now(2)*/Get Up(1)(4)*#/The Gypsy (take-1)(3)*#/Momentum(2)*/The Gypsy (take-2)(2)*. Dizzy Reece (tp), Ronnie Scott (ts), Tubby Hayes (bs), Tony Crombie (p), Lennie Bush (b), Victor Feldman (d). Dizzy Reece (tp), Ronnie Scott (ts), Tubby Hayes (bs), Victor Feldman (p), Lennie Bush (b), Tony Crombie (Four only), Benny Goodman (d). Four(1)*/Turnpike (unissued)/Together*/Darn That Dream*/I Surrender Dear*/I've Lost your Love*. Color blind*#(DB out)/Blues In Trinity*#(DB out)/Just A Penny*/Round About Midnight*#+(DR,DB out)/I Had The Craziest Dream*#(TH,DB out)/Eboo*/Close Up*#/Shepherd's Serenade*#^. 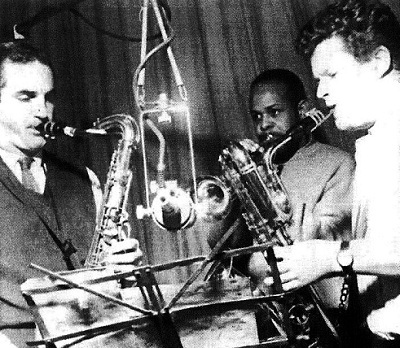 Dizzy Reece (tp), Tubby Hayes (ts, bs), Lloyd Thompson (b), Phil Seamen (d). Main title (Nowhere To Go)*#/The Escape And The Chase*#/The Search (On The Scene)*/The Sunset Search (Nowhere To Go)*. Dizzy Reece (tp), Hank Mobley (ts), Wynton Kelly (p), Paul Chambers (b), Art Taylor (d). The Rebound*/A Variation On Monk*/I Wished On The Moon*/The Rake*/I'll Close My Eyes*/Groovesville*. Dizzy Reece (tp), Stanley Turrentine (ts), Bobby Timmons (p), Jymie Merritt (b), Art Blakey (d). The Case Of The Frightened Lover*/The Story Of Love*/Ye Olde Blues*/Tenderley*/Achmet*. Dizzy Reece (tp), Walter Bishop Jr. (p), Doug Watkins (b), Art Taylor (d). Yesterdays*/Our Love Is Here To Stay*/Once In A While*/Ghost Of A Chance*/Blue Streak*/Eb Pob*. Dizzy Reece (tp), Stanley Turrentine (ts), Musa Kaleem (ts,fl), Duke Jordan (p), Sam Jones (b), Al Harewood (d). Goose Dance*/Sands*/Comin On*/The Things We Did Last Summer*. Dizzy Reece (tp), Stanley Turrentine (ts), Duke Jordan (p), Reggie Workman (b), Art Taylor (d). Flight To Jordan*/Si-joya*/Split Quick*/Squawkin'*/Diamond Stud*/Starbrite*/Deacon Joe*/I Should Care* (DJ + rhythm only). Dizzy Reece (tp), Joe Farrell (ts,f), Cecil Payne (bs), Hank Jones (p), Ron Carter (b), Charlie Persip (d). The Shadow Of Khan*/The Story Of Love*/Yamask*/Spiritus Parkus (Parker's Spirit)*/Summertime*/Ackmet*. 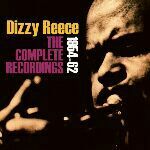 During 1968 Dizzy Reece worked and recorded with the Dizzy Gillespie big band. On November 7th a concert in Berlin, Germany with the Gillespie "Reunion" big band celebrating 20 and 30 year anniversaries was recorded by the German label MPS but not released in the UK. Again in November a BBC TV-cast by "Dizzy Gillespie and his Orchestra" was issued on Beppo, a UK record label. A recording titled The Big Band was made by the "Dizzy Gillespie Big Band" in Europe and was issued on the European LRC label. Dizzy Reece (tp), Slide Hampton (tb,arr), Dexter Gordon (ts), Kenny Drew (p), Niels-Henning Orsted Pederson (b), Art Taylor (d). My Blues*/You Don't Know What Love Is*/A New Thing*/What's New? */The Shadow Of your Smile (dr,sh out)*/A Day In Vienna*. Dizzy Reece, Dean Pratt, Don Sickler, Joe Gardner (tp), Kiane Zawade, Benny Powell (tb), Charles Davis, John Jenkins (as), Clifford Jordan, Junior Cook, Lou Orenstein, Willie Williams (ts), Robert Eldridge (bs), Ronnie Matthews (p), Ed Howard (b), Tommy Campbell (d). Third Avenue*/Angelica*/Old Bo*/I Waited For You*/Introduction To Evidence*/Evidence*/I'll Be Around*/Bearcat*/Down Through The Years*/Charlie Parker's Last Supper*/Don't Get Around Much Anymore*/Band Roster*. Dizzy Reece, Steve Furtado, Dean Pratt, Don Sickler (tp), Brad Shigeta (tb), Kiane Zawade (euph), Jerome Richardson, Sue Terry (as), Clifford Jordan, Lou Orenstein, Willie Williams (ts), Charles Davis (bs), Ronnie Matthews (p), David Williams (b), Vernell Fournier (d). Third Avenue*//I Waited For You*/Down Through The Years*/Charlie Parker's Last Supper*/Don't Get Around Much Anymore*/Highest Mountain*/Con Man*/Status Quo*/Japanese Dream*.